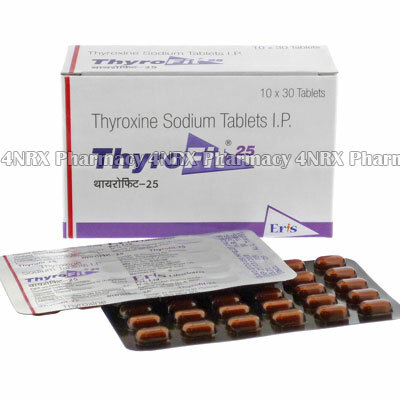 What is ThyroFit 25 (Thyroxine Sodium) used for? Thyrofit (Levothyroxine Sodium) is a synthetic replacement for Thyroxine, a hormone usually produced by the thyroid gland. Thyroxine is necessary for regulation of the body`s energy and metabolism. Levothyroxine is needed by people who cannot produce enough thyroxine on their own. This may be because of hypothyroidism, hormonal imbalances, or when the thyroid has been removed by surgery or radiation. Thyrofit is also used to treat or prevent goiter (an enlarged thyroid gland). How should I use ThyroFit 25 (Thyroxine Sodium)? Thyrofit dosage needs to be individualized based on biochemical testing and treatment response, as well as factors such as age and weight. Follow the dosage instructions provided by your doctor. Each pack of Thyrofit contains 30 x 25mcg oral tablets. The tablets should be swallowed whole on an empty stomach before breakfast. Most people will need to take just one dose in the morning. Swallow the tablets whole with a glass of water to ensure the tablet does not swell and become lodged in the throat. What are the side effects of ThyroFit 25 (Thyroxine Sodium)? If you notice any signs of an allergic reaction to Thyrofit such as hives, difficulty breathing or swelling of your face, lips, tongue, or throat, seek medical help immediately. Thyrofit can result in some unwanted side effects. Thyrofit should be safe to use during pregnancy, but a dosage adjustment may be advised by your doctor.